by Eric ~ October 1st, 2014. The reason why I decided to run this card is for the reason of this deck runs mostly basics. This could be also a setup for Colress, or your one way ticket for free retreat, thanks to getting Darkrais. It could possibly a way to get back your Silver Ash’d Pokemon back. 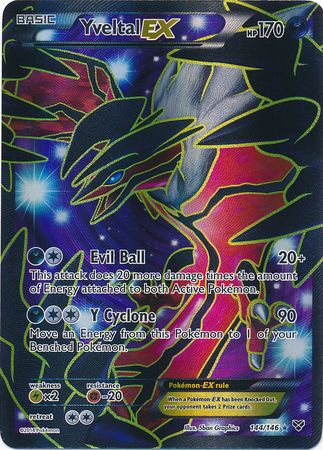 The reason why I decided to run this card is because of how nice it is that Yvetal players don’t need to run Shadow Circle thanks to nobody trying to tech against Yveltal. The threats in our format are Seismitoad, Pyroar, and Genesect, not decks like this currently. Overall, I think this is a strong play due to the power of of Yvetal, and how everybody thinks Yvetal is dead with the rotation of both Dark Patch AND Sableye. However, I think this deck would be a strong play due to the amount of people underestimating this deck and more focusing on Pyroar, Seismitoad, and Genesect. Why I chose this deck: It’s quite easy to wrap around, and it’s very powerful with just one energy. I kid you not when I say this, it’s possible to get a turn one “Night Spear” with a Landorus. Let’s get to the skeleton, shall we? This deck needs no further explanation, I feel that most of these cards are straightforward. However, there is a couple things that I may add with the 7 extra slots. I think this reason is quick simple. You would want this to power up your Landoruses and Lucarios. Also, it could be a nice counter to Pyroar decks while giving some power to your attackers. Why I chose this deck: This deck is a very cheap deck to play, and has counters to Pyroar, Mewtwo, Lucario, Seismitoad, Genesect, and Virizion. If you choose this deck, give it at least a couple hours of playtesting just to get a feel for this deck. This deck is all about giving prizes early game for prizes middle to late game. With my experience with this deck, Life Dew is the best option since it forces my opponent to take 7 cards, or I could get a free 3 damage out in the field to set up a big KO. Audino is only there to be in the discard pile. It literally has no other use. It’s ability can heal 10 damage AND remove all status effects, which makes Hypnotoxic Laser useless. Wrapup: In short, I feel this deck would be a strong play just for the matchups it holds. However, I strongly recommend to watch out for Plasma decks. They are the main enemy of this deck, but they are not very common in the Standard Format. But hey, I could be wrong. As you can see, we have a somewhat diverse format. Yes, we have our Water, Fire, and Grass, but we have many other popular decks that can fight in a competitive environment. We just need the right person to guide the deck. Heck, I think one person actually got a good score with a Flareon/Drifblim deck last Nationals, I think. Don’t quote me on that. Today’s question: How are YOU preparing for the Pokemon Regionals upcoming soon? Good luck to all participating, and Eric signing off!